It has been a while since Steven Spielberg has treated audiences to a major live-action blockbuster. That is all going to change in early 2018 when the highly anticipated adaptation of Ernest Cline's beloved sci-fi novel Ready Player One hits theaters. Production recently started on this massive undertaking, with some set photos having just hit the web, giving us a look at the dystopian world that Spielberg is crafting. Filming is currently taking place on Ready Player One in Birmingham, England. Thanks to the Twitter I Choose Birmingham, we now have a couple of videos and photos from the set. One of the videos shows the crew setting up cameras, lights and other such things, but it shows off the background, which is very broken down, decrepit and dour. The second video simply shows a very beaten up, graffiti plastered postal truck being parked. The rest of the photos show broken down cars all over the street, seemingly very faithful to the world that Cline set up in his novel. 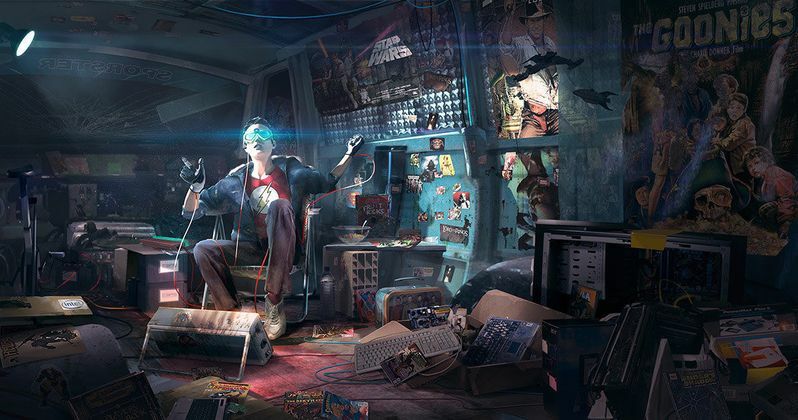 The novel Ready Player One was released in 2011 and was instantly well received by fans and critics alike. It has also sold like gangbusters, becoming a New York Times bestseller, and is currently on its 17th printing. The concept is something that will be tricky to adapt to the big screen, but is very ripe with possibility, and given that the book references Spielberg's own work an awful lot, it makes sense that he could be the guy to do it. For those who may not have read it, here is a plot synopsis of the book from Amazon. "In the year 2044, reality is an ugly place. The only time teenage Wade Watts really feels alive is when he's jacked into the virtual utopia known as the OASIS. Wade's devoted his life to studying the puzzles hidden within this world's digital confines-puzzles that are based on their creator's obsession with the pop culture of decades past and that promise massive power and fortune to whoever can unlock them. But when Wade stumbles upon the first clue, he finds himself beset by players willing to kill to take this ultimate prize. The race is on, and if Wade's going to survive, he'll have to win-and confront the real world he's always been so desperate to escape." The cast includes Tye Sheridan as Wade Watts, Olivia Cooke as Sam, a Canadian blogger who is known in the Oasis world as Art3mis, and will become a love interest for the lead character. Rogue One: A Star Wars Story actor Ben Mendelsohn is playing the executive of an Internet company who is trying to take control of Oasis. Spielberg's new favorite man Mark Rylance and Simon Pegg have also recently joined the cast as James Donovan Halliday and Orgen Morrow, who co-created Oasis. Comedian T.J. Miller is also on board as the online troll named i-R0k. Steven Spielberg is directing from a script by Zak Penn and Ernest Cline, who wrote the original novel. Ready Player One was originally set for release on December 15, 2017, but Disney just so happens to be releasing their highly-anticipated sequel Star Wars: Episode VIII on that day. So, Warner Bros. wisely announced in February that they will instead release Ready Player One on March 30, 2018, where it currently doesn't have any competition. Be sure to take a look at the new set photos for yourself below. Movie lights and set prop cars. It's all so glamorous!